Maradona, who ended his career at Boca Juniors and is renowned for his anti-establishment views, channelled his frustrations in the direction of Dominguez with a trademark blast. “I want to tell Dominguez – how the hell does he think I can get myself and my family to the game in Madrid?” Maradona told Radio La Red. 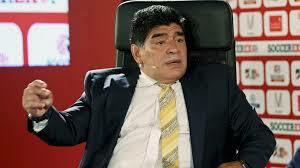 Maradona, who also vented his anger towards the Argentine FA, sees no reason why the twice postponed fixture can’t be played at another Buenos Aires club, Vélez Sarsfield.